To enable and incentivize the deployment and growth of the Hyper-V and System Center products, Microsoft released a software license which brings together the key management and protection technologies. This is by no means a new license – in fact it first released in 2007 – but it has come to the fore in recent months as companies focus more on the cost savings to be had from virtualisation and the System Center suite of products. Further to this, and the really big win here, is that when the SMSE license is applied to a single physical server it permits unlimited license rights to any Operating System Environment (OSE) running on that physical server. If we were to install Windows Server 2008 Enterprise Edition with the Hyper-V role, we would find that we are licensed to run 4 OSE’s as Virtual guests on that physical server, in addition to the host OSE (provided we only use the host OSE for hosting and management of the guests). 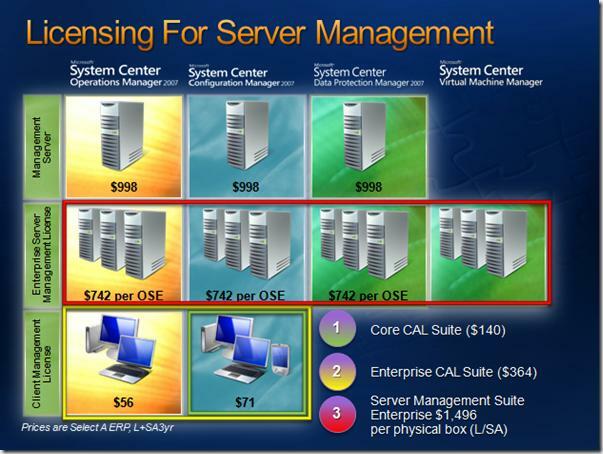 Then, when applying the SMSE license to the physical server, we are automatically licensing the host and each one of the guests with one of each of the above listed products -in this case 5 OSE’s. The real benefits, however, come when considering that a physical host licensed with Windows Server 2008 Datacenter allows unlimited(anonymous) OSE’s to be run – limited only by the level of hardware specified on the physical host. Clearly combining Windows Server 2008 Datacenter and SMSE allows for unlimted OSE’s and unlimited management for the physical host and the guests. One to ponder! For more information on SMSE, see the above link to the Microsoft website and also here for more general blog commentary on the products involved in SMSE.